This is the back story to the book Kaizen Forever. In the spring of 2014, I was approached by Rudy Go, a retired colleague from Pratt & Whitney and kaizen consultant. He was working for Shingijutsu USA and asked me if I would be interested in writing a book about Shingijutsu. I said that I would be interested, particularly because of my prior experiences with Shingijutsu. I learned genba kaizen from Shingijutsu consultants beginning in the summer of 1994. Learning Shingijutsu-kaizen directly from the people that practiced it at Toyota was a life-changing experience. Not enough people know or understand that. Rudy contacted me because he admired my books and how I faithfully presented Toyota’s management system in my books. He and others convinced Shingijutsu leaders to support a book project and that I was the right author for the job. 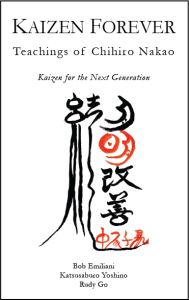 As a first step, I was invited to attend the first Shingijutsu-Kaizen Conference in Hartford, Connecticut, in May 2014 (see blog posts here and here) to meet Nakao-san and begin preliminary discussions. I began this book project by meeting with Chihiro Nakao to find out what his thoughts were. Afterwards, he agreed to help us and would later provide us with important information to complete our research (as well as eight illustrations drawn by Nakao-san). I teamed up with Rudy and Katsusaburo Yoshino, another Shingijutsu kaizen consultant, and the three of us would author the book. Nakao-san gave us just one specific suggestion: write about kaizen in a way that would appeal to the next generation of young people. This was very important to him, as he nears the end of his career. There were three things for us to consider: First, we did not want to write the same things that other authors have written about kaizen. We wanted to produce something unique. Second, we had to address how to write about kaizen in a way that inspires people to want to practice kaizen. Third, how much do you explain about kaizen? Should the book be few pages with basic, yet inspirational messages, or should it be many pages with lengthy descriptions? Because kaizen is a practical activity, we decided to make the book practical. Therefore, it is few pages in length (98) with sufficient information to guide people on what to do and how to think – but not too much information so that readers would not have to think for themselves. Nakao-san’s teachings come from our collective experience with Shingijutsu-kaizen and our participation in kaizens led by Nakao-san. This represented a large volume of material. Next, we had to figure out how to organize Nakao-san’s teachings. His teachings during genba kaizen span dozens of topics and are deeply intertwined. It would be difficult for readers to understand this. We decided to present his teaching in categories – People, Process, Equipment, Space, Money, Time, and Information – even though Nakao-san does not teach kaizen that way, nor do we, Nakao-san’s disciples, comprehend his teachings that way. We present his teachings as separate chapters only to improve comprehension by readers. The best a book can do is serve as a facsimile for actual genba kaizen, which is different than words on a page. Please understand that. We are careful to note in the book, in two locations, that readers must not comprehend Nakao-san’s teachings separately; they must think about the interconnections. It is very important to do this. If not, genba kaizen cannot be fully understood and will not be practiced as it is intended. In genba kaizen, Nakao-san teaches People, Process, Equipment, Space, Money, Time, and Information in combination with one another to enlighten and deepen awareness of cost reduction through productivity improvement by various means including flow. We wanted this book to be something that readers return to again and again, iterating between genba kaizen and the book, forever. Read it again, and then, once again, apply what you learned at the genba. And so on. That is why the book is available only in print, and not as an e-book. It pairs your physical process improvement activities to a physical quick reference book. We hope we succeeded in creating a book that inspires people to practice genba kaizen the way sensei Nakao-san has taught us. Thank you for putting these teachings together in Kaizen Forever. I found the book to be inspirational, readable, and actionable. We were lucky to be able to get copies for our small team of kaizen practitioners at our non-profit healthcare organization. We’ve had a number of great and challenging conversations around it – and, more importantly, have improved our kaizen practices with what we are learning. That is excellent! I’m so glad to hear that you have improved your kaizen practices as a result of reading Kaizen Forever. Thank you for the feedback.